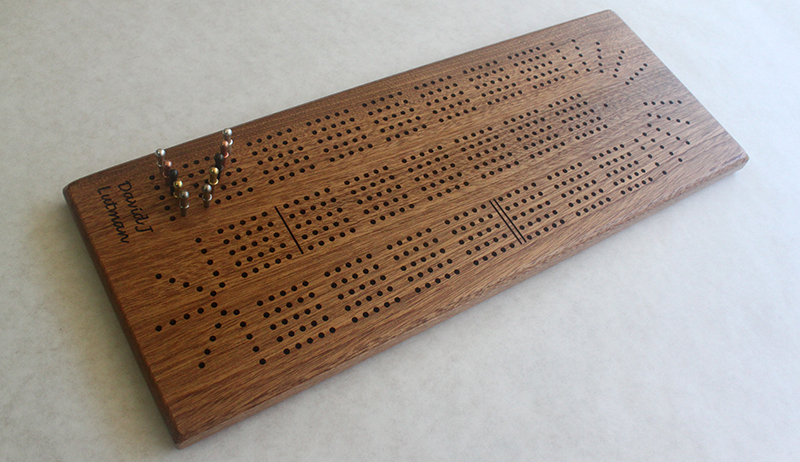 An engraved five track continuous cribbage board in a range of wood species. This engraved five track board is made from solid wood and measures 6.5" by 17". It features five continuous tracks, with an engraved name or initals. It comes with set of 15 metal pegs (3 each of brass, black steel, copper, stainless steel and aluminum). They live in a pocket in the back with a sliding brass plate for closure. The engraving is highlighted with a hand-painted, deep brown acrylic. The top four edges have a generous chamfer adding to the style of the board. After sanding smooth, this board is brushed with shellac to protect the wood. Deal 5 cards to each player. The dealer discards one card of his choice to the bottom of the deck. All four other players put one card into the dealer's crib. Play as usual. First person to say "Go!" gets to restart the round if exactly 31 is not reached. If 31 is reached, the next player to the left of the player reaching 31 restarts.